Bruce Anderson & Dale Sophiea - "Strict" / Bruce Anderson - "Brutality II: Balkana"
I first discovered MX-80 [Sound] via their two albums released on Ralph Records many years ago and immediately tuned into their brand of avant-punk sonic mayhem. With that band in mind, I was pleasantly surprised to hear the music on these more recent side projects by Bruce Anderson and Dale Sophiea. On Strict, Anderson and Sophiea (with help from fellow MX-80's Marc Weinstein and Jim Hrabetin) embark on a journey that is sonically entrancing and even meditative, relative to what we're accustomed to on MX-80 recordings. Consisting mostly of guitar, bass, and samples, the duo manage to create a noise-ambient-rocking atmosphere that is sometimes orchestral, and at others has a rocking free-improv feel. Weinstein's drums give an extra welcome boost of life to the tracks he contributes to. "Brigid" is a standout with dual guitars from Anderson and Hrabetin and drums from Weinstein. Dark and intense, the music seems to flow smoothly but is actually performing the same form of brain surgery that MX-80 themselves are known for. It's just more.... stealthy. Despite the intensity levels, there are also plenty of parts that are calmly atmospheric, ethereal, and even angelic. "Zita" includes jazz structures but with a jamming dirty noise-rock feel that is strangely meditative. "Hugo" is an extended ambient piece that I enjoyed. It's a slowly developing somewhat minimalist work with heavenly choirs and quiet but assertive noise-scapes. "Father Damien" and "Jeanne" are the epic length tracks on the disc, both featuring a noise and meditation contrast that is simultaneously contemplative and aggressive. Beauty and a sense of sinister foreboding coexist to ultimately create harmony. Though it didn't hold my attention consistently throughout, this is an intriguing set that will appeal to fans of experimental guitar landscapes that straddle the border between ambience and noise. A much stronger release, for this listener, is Brutality II: Balkana, a solo outing from Anderson with help, once again, from the MX-80's. 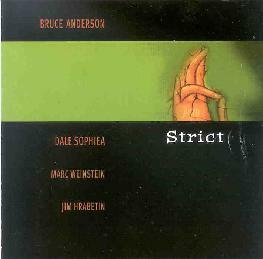 Featuring four, mostly lengthy tracks, Anderson embarks on a journey in which the guitar is an artist's tool, more than it is an instrument. The opening track, "Blood", is actually a full band tune on which Anderson and Hrabetin's guitars create flowing guitar-scape waves and drones that roll along a landscape of sonic peaks and valleys, the volume slowly rising and falling as a parade of sounds, both delicate and harsh, color the music. 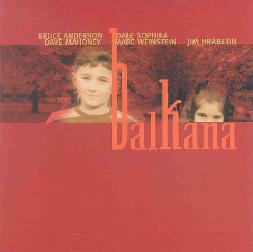 Mahoney and Weinstein embellish the proceedings with subtle percussion, and Dale Sophiea is somewhere in the mix on bass and "narrative flow" (whatever that is). "Cleansing" is the most ambient music I've heard on either of these CD's. It consists of really nice soundscape guitar work from Anderson, and a beautiful deep bass sound from Sophiea flows through in intermittent single notes. And at almost 30 minutes in length, "Feud" is the highlight track being full of sounds and atmospherics that give it a thematic feel. Like the soundtrack to an avant-garde theatrical performance, Anderson explores the guitar's possibilities with passion and emotion. It has a blend of drone, heavy rocking free-improv, and even a bit of dark psychedelia. Near the end of the track there's a cool dual guitar segment with one guitar off on a freakout run and the other sounding like Robert Fripp's soundscape guitar works. The music evolves slowly through the ambience and aggressiveness that has characterized both these releases, though even at it's harshest the music retains a meditative quality, the drones serving as mantras for the mind. In summary, These musicians have shown phenomenal growth over the years and clearly have varied interests. These discs may not appeal to MX-80 fans but anyone into ambient/experimental guitar excursions will find much to enjoy. Definitely start with Balkana. For more information you can visit the Family Vineyard web site at: http://www.family-vineyard.com/. They've got even more releases by the MX-80 crew which I hope to hear soon.